A special evening of celebration was held in Padstow in February to distribute to local charities almost £6,000 raised last year by the Friends of Padstow Christmas Festival. The four-day annual event, which attracts tens of thousands of visitors to the town, has become one of the largest and most successful of its kind in the country. Fundraising events are held throughout the year to raise money for local charities. “It’s really important for us to say a big thank you to the local community which supports the festival so well ever year” said festival organiser Tina Evans. 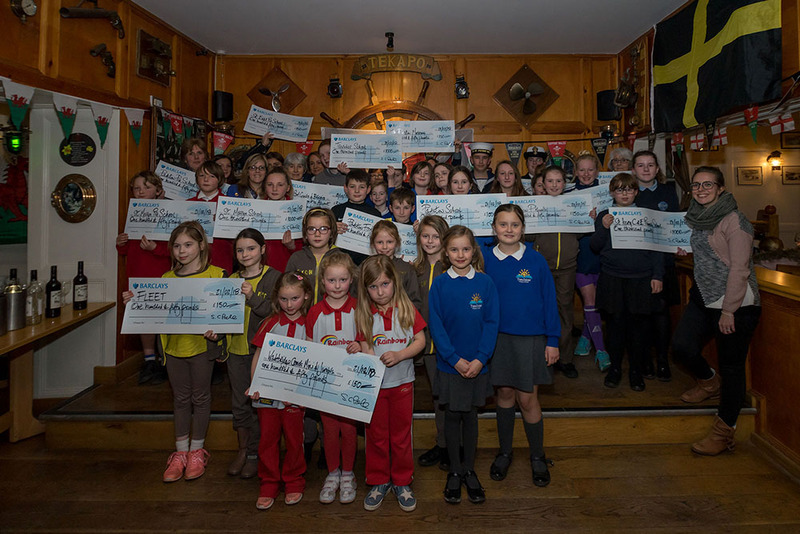 Trevisker Primary School, which was given £1,000, described the festival as a vital community event. “The money we received has helped us reach our target amount for a new stage in our school hall, for which we have been fundraising over the past year,” said Trevisker’s Head of School, Collene Thorpe. “Taking part in the Padstow lantern parade is always a highlight for us in the run up to Christmas. Mrs Evans attributes the successful running of the festival to her 50-strong troop of volunteers, who help with all aspects of the event. This year’s Christmas festival runs from 6 to 9 December.